The article below is adapted from a document written for internal discussion in Socialist Alternative in the wake of the massacre at Sandy Hook Elementary in Newton, Connecticut in December 2012. It was further discussed and approved by our National Committee the following year. We have included some updated factual information in brackets as well as an introduction based on recent events. 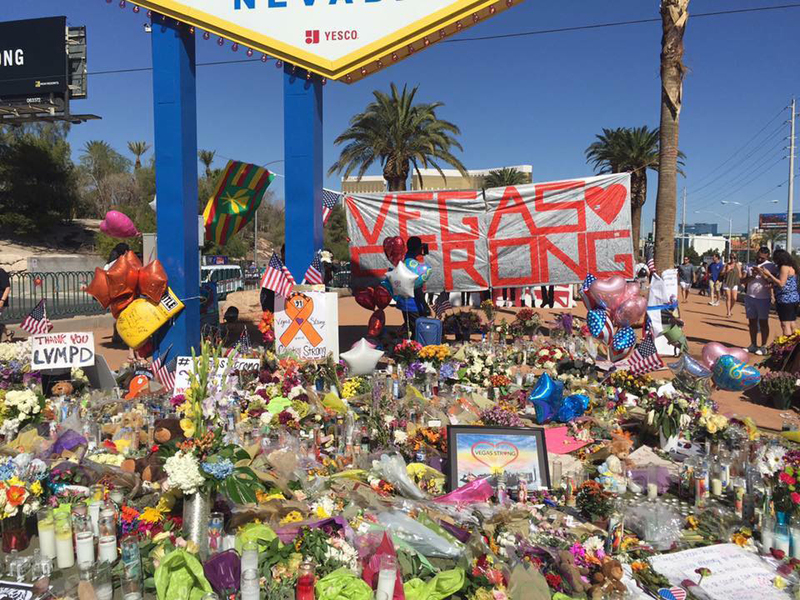 The horrific Las Vegas massacre at the start of October and the more recent massacre at the First Baptist Church in Sutherland Springs, Texas has rekindled the debate about what can be done to prevent the nightmare of recurring mass shootings. There have been renewed calls from liberal politicians for gun control measures. Even the National Rifle Association recently agreed that there should be some limits placed on the availability of “bump stocks” which allowed Stephen Paddock to turn his weapons into killing machines spewing hundreds of rounds of ammunition over the course of a few minutes into the concert crowd across the street from the Mandalay Bay Resort and Casino. But while mass shootings focus public attention, the truth is that they only account for a fraction of the total number of people killed by guns in the U.S. One recent report suggested that more Americans have died due to gun violence since 1968 than in all the wars engaged in by the U.S. in its entire history. The question we posed in the document is whether the situation where society is awash in weapons is in the interests of the working class. We elaborate why, as socialists, we reject both the “gun rights” narrative of the right as well as the liberal gun control narrative. The longer term trend over the past 20 years is actually away from support for tougher gun control measures. For example, according to Gallup the support for a ban on assault rifles went down from 46% in December 2012 to 36% in October 2016. In 1996, by contrast, there was 57% support for a ban. The gun control measure with overwhelming support is universal background checks including for private sales and sales at gun shows. There is also strong support for preventing people with mental health issues and those on government screening lists from buying weapons as well as for a centralized national database for gun sales. Gun rights have become a key issue in the country’s deepening political polarization. It is also clear that the liberal arguments for more sweeping gun control measures have failed to convince broad swathes of the population. The NRA tragically has clearly had some success arguing in sections of the population that the way to combat gun violence in society is for the “good guys” to be armed to the teeth. This points all the more to the left needing to articulate an independent position on how to address the epidemic levels of violence in our society. The massacre of 20 students and 7 adults in a Newtown, Connecticut school in December 2012 by a mentally disturbed young man has reignited the debate on gun control in the U.S. In mid-January, the Obama administration announced its support for a series of legislative measures that would among other things mandate background checks on all gun sales; ban the sale of “military style” semiautomatic weapons and limit ammunition magazines to a maximum of 10 rounds. This proposal to impose limited measures of gun control at the federal level has led to a furious response from the right, led by the National Rifle Association (NRA). However, polls indicate that there is a significant shift in popular sentiment toward supporting such measures. Nevertheless the attempt to strengthen gun regulation at the federal level is for now dead in the water after even the background check measure which polls say is supported by nearly 90% of the public failed to get the 60 votes required to prevent a filibuster in the Senate. It should be stressed that this outcome does not mean the debate on gun control is over. Measures have been brought forward at state level and other massacres, unfortunately inevitable, will revive the issue. It is also clear that a significant section of the elite for their own reasons want to bring the gun lobby to heel. As a Marxist organization with an increasing public profile we need to have a clear position in this public debate. We must look at the historical context of the right to bear arms and gun control both in the U.S. and internationally. We need to analyze the complex causes of the massive level of gun violence that exists in American society and put forward socialist solutions. We must look dispassionately at the real agenda of both the bourgeois forces pushing for gun control and those opposing it. Perhaps most importantly, we must ask whether the arming of large sections of the American population in the concrete circumstances of the early 21st century and given the reactionary individualist ideology that promotes this is really in the interests of the working class. On the other hand, how do we address the ever increasing powers of the state which clearly do pose a threat to any section of American society that would resist the dictates of the ruling class? These are complex issues which cannot be summarized in a few glib phrases. The Second Amendment to the Constitution reads as follows: “A well regulated militia being necessary to the security of a free state, the right of the people to keep and bear arms shall not be infringed.” The context of the amendment in 1791 was the recent Revolutionary War and the belief that the struggle against the British crown was probably not over – this was confirmed by the War of 1812 when the British burned Washington DC to the ground. There was strong opposition to the idea of a standing army based on historical experience in Europe and recent experience with the British Army. Standing armies were correctly seen as the tools of tyrannical regimes. As a result, in the early American republic, a big section of the white male population was armed for military reasons first and foremost. Of course there was no question, as far as the elite was concerned, of allowing black slaves or even free blacks to have guns. Many states required gun owners to register their weapons and prohibited carrying concealed weapons. Broadly speaking, the Second Amendment and the Bill of Rights of which it is part, represents part of the progressive legacy of the American Revolution. But as capitalism developed, the issue of weapons and gun control became inseparable from the class struggle between labor and capital and the desire of the ruling class to maintain the subjugation of the African American population. There have been repeated horrific massacres in U.S. history of working people fighting for their rights. In 1914 during a miners’ strike in Colorado, 21 men, women, and children were killed in Ludlow by machine gun fire from the state militia. In 1937 during a peaceful protest of striking Republic Steel workers and their families in South Chicago, the police opened fire. Ten workers were shot dead and another 40 workers were wounded by gunfire, all of them shot in the back. On the other side, striking workers resisting attacks from company goons and/or the state during strikes have on numerous occasions armed themselves for self-defense. In the 1880s Chicago’s militant German-centered labor movement went as far as creating a workers’ militia. This is not just a question of the dim and distant past. As recently as the 1970s, some miners pickets armed themselves in self-defense during wildcat UMWA strikes. Likewise in the mid-1960s during the civil rights movement, the armed Deacons for Defense and Justice were formed by black veterans to protect civil rights activists against attacks by the Klan and state forces. The Deacons were very effective and played an important adjunct role to the mass protests at the heart of that struggle. The Black Panther Party for Self Defense continued this tradition although their experience also shows the life and death consequences of an “ultra-left” approach to this question. Initially some of the actions the Panthers took were effective in exposing police violence, giving people confidence to stand up and putting a check on the state. On a general political level the Panthers were correct to argue a revolutionary case, i.e. against pacifism, and for the right to self-defense, and indeed to take concrete defensive action that was understandable to broader (not yet revolutionary) layers of the black community and the working class – such as practical measures to defend against violent attacks by racist forces. However, the brandishing of weapons, while being attractive to a minority of revolutionary black youth, was a serious mistake. It contributed to keeping the Panthers isolated from the broader black working class, which sympathized with them but was not prepared to join an explicitly armed revolutionary organization, and played into the hands of the capitalist state which succeeded in brutally crushing them. Even in an actual revolutionary situation, the key issue is not military but political mobilization of the working class and the oppressed on the basis of defensive and democratic appeals to oppose and defeat any violent efforts of the small ruling elite to subvert the will of the majority. This was precisely what the Bolsheviks did in October 1917, the most democratic revolution in history in which there was extremely little violence. The Bolsheviks also made a class appeal to the ranks of the Tsarist army thereby largely neutralizing the old state forces as a weapon for the autocratic regime. Of course history is replete with negative examples where the working class lacked a leadership sufficiently determined to face down the threat of the old order to unleash counterrevolutionary violence. Adventurist attempts by revolutionaries to prematurely “seize power” have also led to bloody defeats for working people. The ruling class always tries to portray its opponents as violent. It is the task of Marxists to demonstrate to the mass of the population that the central source of violence in modern society is capitalism and the capitalist elite. This is particularly true in the United States whose ruling class has waged and is still waging a whole series of bloody imperialist adventures around the world to defend the rule of profit. This is the context in which we must look at gun control. Attempts at gun control have been an ongoing feature of U.S. and other capitalist societies. In Europe, the ruling class made concerted efforts to disarm revolutionary and working class forces in the wake of the revolutionary upheavals of 1848. In general, whatever the reasons given at the time, most attempts at gun control have been at least partly motivated by the desire of the ruling class to disarm its potential opponents, first and foremost the working class. For example, the Mulford Act passed by the California legislature in 1967 which banned the public carrying of a loaded firearm was a direct response to the Black Panthers. The federal Gun Control Act of 1968 was also partly motivated by fear of an armed black population especially in the wake of the 1967 urban upheavals. Marxists have historically opposed such attempts to try to enforce the bourgeoisie’s desire for a monopoly of force. We do not accept the idea that only the state should be armed as a “neutral” arbiter between the classes. All historical experience shows that the state’s armed bodies are not neutral but rather serve the interests of the ruling class. For much of the 20th century, federal gun control measures had bipartisan support. In the wake of the defeat of the radical wing of the civil rights movement, the collapse of Stalinism, and the drastic weakening of the labor movement and any real internal challenges to the power of U.S. capitalism, the debate on weapons within the ruling class shifted away from trying to disarm its potential adversaries. This shift could already be seen during the Reagan administration, with the development of the New Right which took the position that any restrictions on the “right to bear arms” were an attack on the Second Amendment. This was part of a broader process underway in the Republican Party with a turn towards populist and religious appeals. The issue of gun ownership was tied to right-wing populism which used coded racism about crime to mobilize sections of the white working and middle class. This was part of providing a broader political and electoral base for an increasingly aggressive neoliberal corporate agenda. The NRA wielded increasing power. Despite suffering a setback in the banning of the sales of assault rifles from 1994-2004, their influence continued to grow. At state and local level, they have had a string of successful drives to remove restrictions on the “right” to carry concealed weapons. [According to David Frum, writing in The Atlantic, “Since Newtown, more than two dozen states have expanded the right to carry into previously unknown places: bars, churches, schools, college campuses, and so on” (10/3/2017)]. While we would not in general base ourselves on the argument of what the Constitutional “founders” had in mind, let us be clear that the members of Congress who voted for the Bill of Rights in 1789 would not have supported the right to carry concealed weapons into taverns! What is behind the rise of the NRA and the drive to systematically repeal gun control measures? One part is the NRA’s role as mouthpiece for the incredibly profitable gun industry whose sales in 2012 are estimated to have been $11.7 billion and whose profits amounted to $993 million (Washington Post, 12/19/2012) [by 2015 revenue had reached $13.5 billion and profits stood at $1.5 billion]. In the wake of the Newtown massacre, it was revealed that Cerberus Capital, a major Wall Street private equity firm, owned the Freedom Group, makers of the legally owned Bushmaster AR-15 that was used by Adam Lanza. Those making big money off of the sale of guns are not just the manufacturers but retailers like Walmart which is now the biggest seller of firearms and ammunition in America (The Nation, 1/7-14/2013). It is no accident that gun sales have accelerated since Obama came into office in 2008 and have reportedly skyrocketed since his announcement in the wake of Newtown that he would make gun control a priority. Obama’s reelection margin as we have noted was significant but hardly overwhelming. And within the vote for Romney there is a significant section that has been influenced by the fantasies of the far right, specifically the view that Obama is some sort of anti-American Muslim/socialist tyrant. According to the Southern Poverty Law Center, right-wing militia groups and other right wing extremist groups have been growing since 2008 although for the time being none of them has a mass audience. The Tea Party was a vehicle for this development but they were set back after 2011. In reality one of the main right wing groups with a mass base is the NRA itself – as of 2010 it claimed 4.3 million members [5 million as of 2017]. Currently it is used in the interests of the gun industry and to mobilize for “gun rights” as one of several issues that provide cover for the right wing of corporate America to pursue its anti-working class agenda (along with opposition to abortion, immigration, etc.). But we should be clear that while the NRA and its backers currently promote the idea of individually armed citizens and not militias, at another stage a significant part of their heavily armed base could be turned into an overtly counterrevolutionary force to terrorize left-wing activists, workers in struggle, people of color, immigrants, and LGBT people as an auxiliary force to the capitalist state. 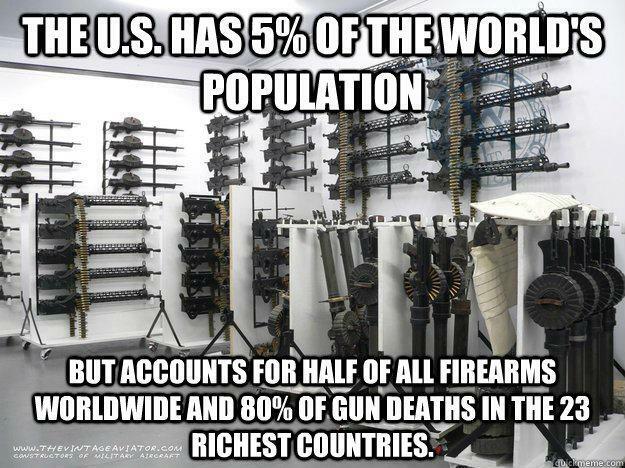 We also need to look at the specific features and causes of the extremely high level of gun violence in U.S. society. Nevertheless we also need to recognize that the homicide level declined sharply in the 1990s. As of 2009 the homicide rate was at its lowest level since 1964 and half of what it was at the start of the 1980s. While this is a significant fact, the level of violent death is still staggering. In 2010, there were 14,748 homicides. 67.5% of these killings involved a gun (“Crime in The United States 2010, FBI Statistics” ). The homicide rate nearly doubled from the mid 1960s to the late 1970s. In 1980, it peaked at 10.2 per 100,000 population and subsequently fell off to 7.9 per 100,000 in 1984. It rose again in the late 1980’s and early 1990’s to another peak in 1991 of 9.8 per 100,000. From 1992 to 2000, the rate declined sharply. (Bureau of Justice Statistics) [in the past few years, the number of homicides has been creeping upward nationally, and dramatically in some cities like Chicago]. And while homicide levels have declined to the level of the early 1960s, violent crime overall (much of it involving guns) remains at a much higher level than it was 50 years ago (FBI Uniform Crime Reports). While media attention has focused on massacres from Virginia Tech to Aurora, Colorado, gun violence is concentrated in poor neighborhoods in big cities and most of the victims are poor people of color. Perhaps the most extreme example is New Orleans where the 2004 homicide rate was 52 per 100,000, ten times the national average. Chicago has recently experienced a spike in gun violence. But as The New York Times noted, more than 80 percent of the Chicago’s 500+ homicides in 2012 took place in only about half of the city’s 23 police districts, largely on the city’s South and West Sides (1/3/2013). Opponents of gun control will argue that the sharp decline of homicides shows that the prevalence of gun ownership and lack of much regulation does not mean that violence will increase. On the other hand, proponents of gun control like New York City’s former Mayor Mike Bloomberg will cite the fact that homicides in NYC are at a 50 year low [334 in 2016 compared to a high of 2,245 in 1989] as proof of the effectiveness of aggressive policing policies and the drive to get illegal guns off the street. In reality in many big cities there is much tighter gun control than in suburbs and rural areas. Massive police presence in poor communities has undoubtedly had some effect but at the cost of creating mini-police states where the police systematically harass young men and a massive prison gulag. “The number of U.S. homicides has been falling for two decades, but America has become no less violent. “Crime experts who attribute the drop in killings to better policing or an aging population fail to square the image of a more tranquil nation with this statistic: The reported number of people treated for gunshot attacks from 2001 to 2011 has grown by nearly half. Improved medical care doesn’t account for the entire decline in homicides but experts say it is a major factor. Why is American Society So Violent? There is no single reason for the level of violence in society. Clearly, the fact that the U.S. is one of the most – if not the most – unequal of the Advanced Capitalist Countries (ACCs) is very relevant. For example the U.S. has a higher poverty rate (17.2% in late 2000s) compared with 22 other OECD countries (Economic Policy Institute, based on OECD Stat Extracts). As documented in The Spirit Level: Why Equality is Better for Everyone by Richard Wilkinson and Kate Pickett, the level of inequality in a society contributes directly to the level of alienation. But of course massive inequality is the result of the particular development of U.S. capitalism. U.S. society has also been steeped in violence from its birth. One element of this historical legacy was that the U.S. was a frontier society where the violent campaign to wrest land from Native Americans lasted well into the 19th century. This involved the arming of a significant section of the population. Even more important is the legacy of chattel slavery and the ongoing violent repression of African American communities to the present day. The “war on drugs” beginning in the 1970s was an attempt to criminalize and suppress black youth whom the state saw as the most radical section of society, as well as a political/electoral strategy to make a coded appeal to racism under new conditions with the end of legal segregation. This has led the U.S. to have the highest level of incarceration in the world – which in itself is a huge source of violence. Hundreds of thousands of nonviolent drug offenders enter the extremely violent prison system and come out with far fewer rights and far more alienated from society than when they entered. In many of the most depressed communities in the U.S. there exists a toxic combination of systemic poverty, massive alienation, and ferocious state repression. Violence is the inevitable result. Does the availability of weapons contribute to the level of violence? Undoubtedly but it is not the central cause. And while the dynamic is not the same in more affluent communities like Newtown, it is undoubtedly the case that stress because of economic uncertainty and general social alienation are pervasive in American society. It can be argued that alienation for some young people in some suburbs may be even worse due to the lack of recreation facilities, areas to socialize, etc. An author of a study of “rampage shootings” points out that “There has been only one example of a rampage school shooting in an urban setting since 1970” (The Nation, 12/19/2012). Added to this is the severely ineffective mental health system, an inevitable result of for-profit medicine and the cuts in funding for mental health and social services. These factors have all contributed to the spate of massacres. U.S. imperialism’s willingness to unleash massive violence around the world also directly contributes to the violence within the U.S. itself. In a direct sense it has led to a massive expansion of the state justified by the “war on terror.” Obama and other capitalist politicians repeatedly call to “end the violence” inside America while using drones and state assassination abroad and militarizing the police domestically. But there are other indirect effects as well. As Marxists point out, cultural production inevitably reflects the dominant (ruling class) values of society. Given the commitment of the U.S. ruling class to endless violence against its perceived enemies it is not surprising to see this reflected in movies, videogames, and music which idealize a macho, gun toting cult of death. After years in which gun control measures especially at the federal level were seen by liberals as politically unfeasible because of the strength of the NRA, the aftermath of the Newtown massacre caused the issue to return to center stage. Obama decided to make this one of the central issues of his second term alongside immigration reform, fiscal “reform,” and climate change. The debate on gun control as played out in the capitalist media features only two sides: on the one hand high profile Democrats, big city mayors and a section of the bourgeois who have decided that it is time to take on the NRA and on the other side right wing Republicans, backed up by the NRA who are digging in to oppose almost any gun control measures. Our starting point in formulating our position should be sympathy with the understandable desire of most ordinary people to do something about gun violence, particularly to stop the horrific string of massacres. We completely rejected the NRA’s proposal that the appropriate response to Newtown was to put an armed police officer in every school in the country – right wingers have even raised the idea of allowing teachers to carry concealed weapons in the classroom and incredibly South Dakota passed a law to allow this! Their argument that the only way to stop “bad guys with guns” is to have more “good guys with guns” on the streets is a recipe for even more violence in society not less. While we strongly believe in the right of working people, racial minorities, and the oppressed to defend themselves against the violence of the bosses, the state or reactionary groups, the current level of gun violence in the U.S. is actually an obstacle to the development of social struggle. While defending our general theoretical position on the state – and not making any concession to liberal ideas that the state is neutral we need to examine the question concretely under the current conditions, balance of forces, and consciousness. In the situation prevailing in the U.S. today, does the current regime of widespread access to guns actually help strengthen the position of the working class? The reality is that it does not, and in fact the past 30 years – when the tendency has been for gun control to be relaxed – has seen a major offensive by big business, an undermining of democratic rights, and the strengthening of the repressive powers of the state. The dominant forces arguing against gun control promote a right-wing, individualist, racist, and sexist ideology that weakens the working class. Furthermore the threat of violence, ranging from the everyday threat of shootings in many communities up to and including the threat of terrorist attacks, has given the state ready-made excuses to ramp up its powers of repression. That does not mean we should adopt the position of the liberal gun-control advocates or echo the view that guns are the main problem in society. We need to put forward an independent, working-class position. We reject the NRA argument that the type of limited gun control measures proposed by Obama are the beginning of the end of the Second Amendment or the right to bear arms. There is no serious proposal being put forward to try to disarm or partially disarm the population as a whole. The only areas where there are forcible attempts by the police to disarm people are public housing projects in the inner cities. But opposing the attempt of the NRA to whip up collective paranoia is not sufficient. We also need to be clear that there are many legitimate reasons why people want to own guns. In rural culture, guns are widely used for hunting, dealing with predators, and entertainment. This does not inevitably lead to massive levels of violence. Likewise many suburban and urban dwellers understandably want to own a gun for protection. This is often particularly the case in areas where gun violence is endemic. It is not surprising that many women want to own a gun for self-defense. Socialists are not pacifists and we do not criticize ordinary people for owning a gun or wanting to. But the question which most ordinary people want answered now is how to significantly reduce the violence. The elite advocates of gun control do not have a serious answer to this question. Even if all the measures proposed by the Obama administration were passed into law the history of recent gun control measures suggests that the extremely powerful gun industry will find ways around them. This is what happened to the 1994 “ban” on assault weapons. The other fundamental reason that the ruling-class gun-control lobby can’t show a way to seriously reduce violence is that, as has already been pointed out, the central source of violence in society is capitalism itself including the capitalist state. Serious measures to reduce violence would include ending the “war on drugs” and decriminalizing most or all drugs. (It should be stressed that decriminalization is not the same as legalization. Essentially it means trying to treat drug addiction as a public health problem first and foremost.) Releasing the hundreds of thousands of nonviolent drug offenders from prison and the dismantling of the bloated and racist criminal injustice system would do more to reduce violence than any gun control measure. We also advocate taking serious measures against the massively profitable gun industry such as banning the sales of weapons by these companies (or the government) to various right-wing regimes around the world. We also are for ending the military adventures of U.S. imperialism abroad and massively reducing the scale of the military and the Pentagon budget. The resources freed up could be used to create jobs and improve education, health care (including mental health), and social services and thereby contribute to reducing violence abroad and at home. Finally we are for repealing the Patriot Act and other legislation that has legalized a massive security state that has done precious little to improve the safety of ordinary people but has certainly contributed to a big increase in state violence. Simply enacting a massive jobs program, a $15 an hour federal minimum wage and other anti-poverty measures, and a single-payer, socialized health-care system which prioritizes mental health care would be huge steps forward in creating a saner, less violent society. We advocate all measures that would reduce the level of inequality in society and that would dismantle institutional racism, but we stress that only by uprooting capitalism can we create a just, egalitarian society. However, even limited reforms quite quickly come up against the limits of this diseased and decaying system. Again it should be stressed that these measures we are proposing would be far more effective in reducing gun violence than “gun control” which is likely to be very ineffective. But in the context of our wider aim of strengthening the struggle of working people, we support some gun control measures including mandating background checks on all gun sales, banning the sale of “military style” semi-automatic weapons, and reducing the number of rounds in ammunition magazines on the basis that they would act to reduce the level of violence even if only to a limited degree. However, we have reservations about how background checks proposals are often written. Banning anyone with a conviction from buying a gun in practice means excluding a significant section of the black working class. At the very least, there should be an appeal process built into background checks. Again we are in no way saying that many ordinary people do not have entirely legitimate reasons for owning or wanting to own weapons but we do not see the present situation as being in the interests of the working class. Not all issues have a simple yes or no answer. Our position embodies a certain contradiction but really it is reality which is full of impossible contradictions as long as we continue to operate within a capitalist framework. Next articleHonduras. Rebelión popular contra el fraude electoral y el hambre. ¡Fuera JOH!